New England Patriots Head Coach Bill Belichick ’75, P’07, Hon. ’05 and his daughter, Amanda Belichick ’07, visited campus on Nov. 3 during Homecoming/Family Weekend. 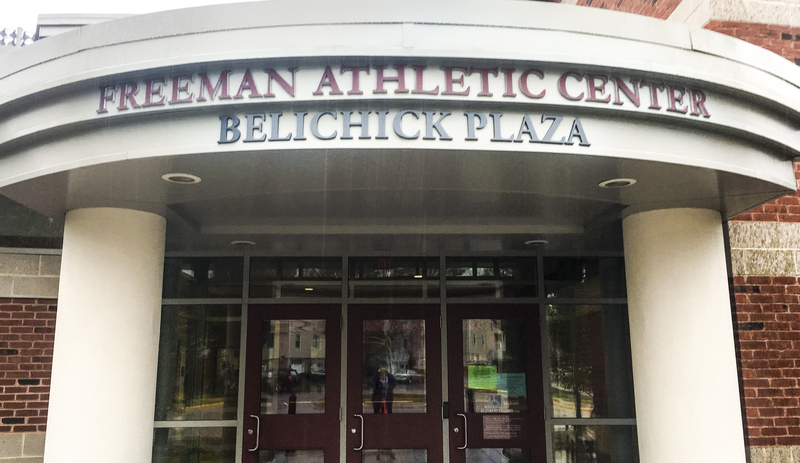 The Belichiks were on campus for the opening of Belichik Plaza, a lobby at the Freeman Athletic Center. Bill Belichick has received an honorary doctorate from the University as well as the Baldwin Medal, the highest honor awarded an alumnus for distinguished achievement. As a student, Amanda Belichick was the captain of the Lacrosse team. She later coached the Lacrosse team from 2013-2015 while acting as an adjunct professor of Physical Education. Currently, she works as the coach of the women’s Lacrosse team at the College of Holy Cross in Worchester, Mass. The Belichicks began their visit by greeting and speaking with the Wesleyan football team. 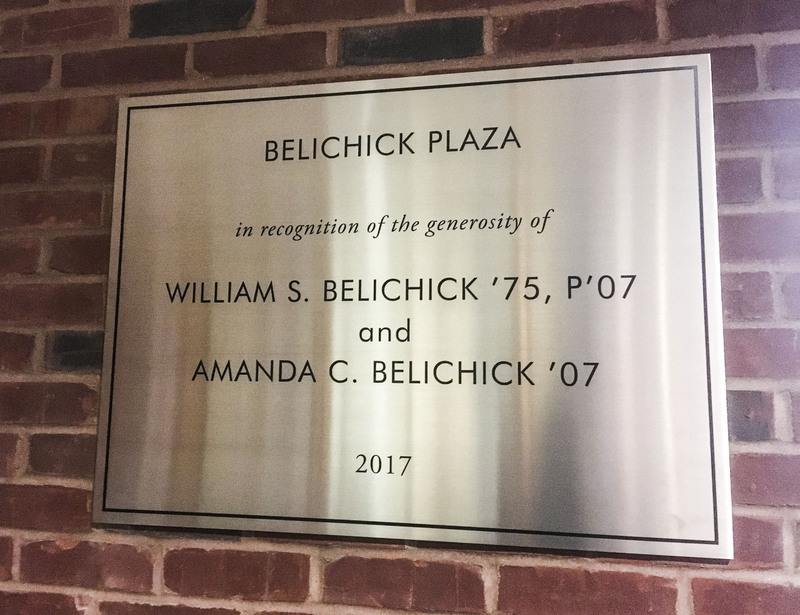 After speaking with the team, the Belichicks attended a reception in the newly named Belichick Plaza, located at the Warren Street entrance of the Freeman Athletic Center. 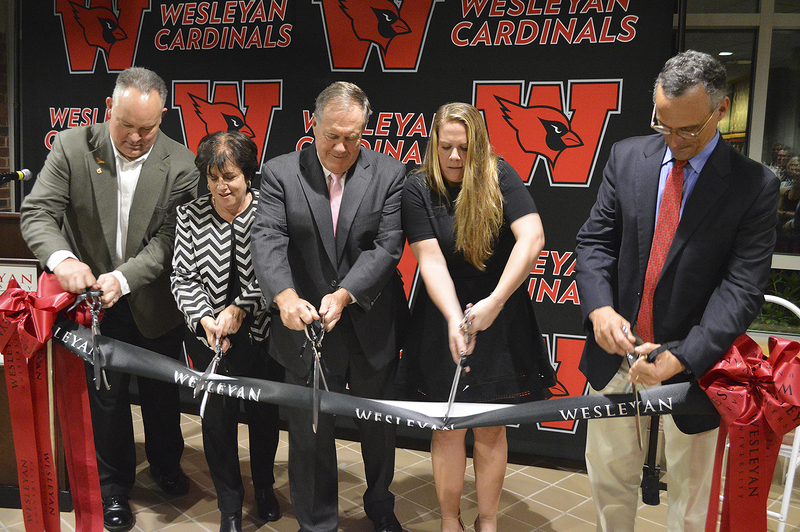 Mike Whalen, the Frank V. Sica Director of Athletics, Board of Trustees Chair Donna Morea ’76, P’06 and President Michael Roth joined the Belichicks for a ribbon-cutting ceremony. Whalen also presented the Belichicks with personalized sweatshirts. After opening the gifts, Whalen and Belichick cut the sleeves off of the new sweatshirt, in the spirit of the sleeveless sweatshirts Belichick wears on the field. “I think the best part of the night was when Bill and Mike Whalen ’83 cut the sleeves off of the Wes sweatshirt,” Morea added in an email to the Argus. Whalen, Morea, and Roth all praised the Belichicks, citing their financial contributions to the University and their role as exemplars of effective leadership.